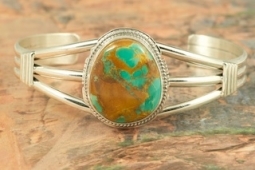 Genuine Manassa Turquoise Stone set in Sterling Silver Bracelet. This Turquoise is also referred to as King�s Manassa Turquoise. The Manassa Turquoise mine is located in Manassa, Conejos County, Colorado. Created by Navajo Artist Larson Lee. Signed by the artist.